This is an update on an earlier post on removing spam posts. Removing spam posts is hard because it requires actually reading the post and deciding if the post is spam or not and then using moderator tools to remove these posts. If your forum is overwhelmed with spam posts, this is a Herculean endeavor. Ideally though posts could be “read” by software and it would make the judgment on whether it is spam or not. The Cleantalk extension for phpBB 3.1.x and 3.2.x can do just this as well as lots of other really cool tricks. My customers love Cleantalk, but the service is not free. However, it is so inexpensive that it easily justifies spending $8/year for the service. You can subscribe on the Cleantalk website. As of this writing, you can try it for free for 7 days. After 7 days, it won’t bring down your forum but it will stop working. Cleantalk is essentially a huge database of addresses of known spammer sites. While it’s not perfect, based on the experience of my clients it is about 99% perfect. I originally recommended it as a spam registration solution for my clients. It still does that but is less necessary since phpBB 3.2. This is because since phpBB 3.2, version 2 of Google’s reCaptcha is supported. Unless it gets hacked, as long as you have it properly configured as a spambot countermeasure it should prevent virtually all spam registrations. However, it has two powerful features that still keep it relevant for phpBB forums. Cleantalk is installed like any other extension. While it can be downloaded from phpbb.com, you should download it from Cleantalk instead or from its GitHub page. This is because as of this writing the version on phpbb.com does not include the spam firewall feature, and you will probably want to enable this feature. 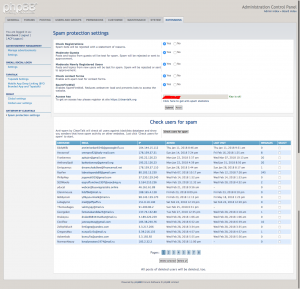 You can access it through the Administration Control Panel: ACP > Extensions > Antispam by Cleantalk. Before you can do much with it you have to enter your Cleantalk key which you can get from their website or by pressing the button in the extension that should retrieve it for you. 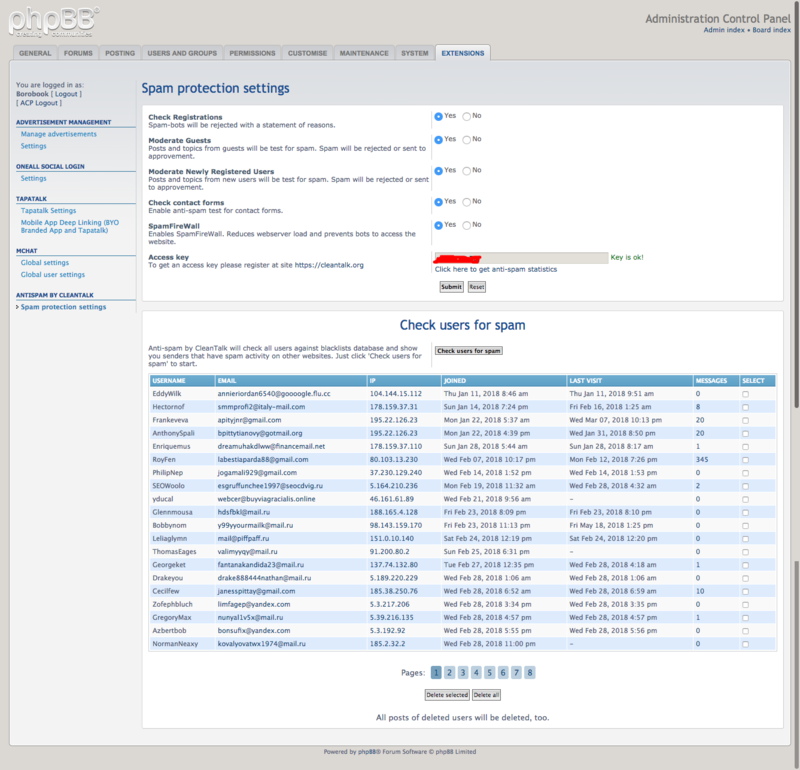 As you can see from the image, once the extension is enabled and the key is properly configured there is a prominent Check users for spam button on its page within the Administration Control Panel. If you have lots of users, it may hang. Based on my experience though the next time you go into its interface you will see a list of potential spammers. As I said, it is not perfect. So I recommend that for users with posts to check these out these users topics to make sure their posts are spam before deleting them. For those you want to delete, check the boxes next to their usernames and then press Delete marked. You can also press Delete all to remove all users and their posts. You may have to go through many pages to delete all spam users and their posts, but this is obviously much faster than doing a visual inspection of all your posts. This is a new feature which as of this writing is not available if you download the extension from phpbb.com. It keeps almost all spammers from hitting your site at all. Instead, Cleantalk’s servers grab it first. In the event the user is legitimate, there is a link that will take them to your website. Why is this useful? Because it reduces the stress on your server by limiting it to legitimate traffic only. It speeds up the performance of your forum and makes it less likely that you will have to pay for the cost of a higher class of hosting to handle your traffic. Isn’t that worth $8 a year? Cleantalk has one other useful feature: the ability to stop contact form spam. Of course you can disable the contact form (ACP > General > Contact page settings) and that will solve that issue. Or you can have Cleantalk essentially moderate it for you, passing on only valid contact forms to you. Simply check that option on the extension’s page and submit the form. Somewhat oddly, the phpBB group did not tie the contact form to the spambot countermeasure feature of phpBB. Perhaps that will come in a future release. In any event for forums that get lots of spam and/or lots of traffic, using the Cleantalk service with the Cleantalk extension for phpBB is a no-brainer providing you know about it. Now you do!